Rated 5 out of 5 by GraniceB from Loved how easy it was to use, no fuss, no mess. And the color is just what I wanted, and my hair feels soft and manageable after coloring it too. Rated 5 out of 5 by Anonymous from The color covered very well. I like how it doesn't smell like ammonia like other brands. It leaves your hair feeling soft. 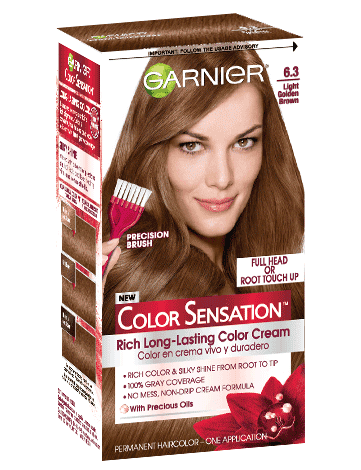 Rated 4 out of 5 by Anonymous from I used the Garnier Color Sensation 6.3 Light Golden Brown color to improve on my highlights. I already had bronze highlights so this blonde was easy to apply. The color was very easy to mix and apply. After trying other brands of color, blonde never took in my hair. Garnier's brand did and it is nice and vibrant and shiny too! I would recommend this brand for anyone looking to get the exact color match that is on the box. Rated 5 out of 5 by KellinaM from I absolutely loved the Garnier Color Sensation in Light Golden Brown. It was the perfect color for me and the application was incredibly easy. I didn't end up with any drips or messes like I have with other brands and my "trash towel" I use to protect my clothes when dying my hair was completely free of marks. Not only was the dye itself easy to use and apply, it also made my hair super soft. I honestly can't stop touching it! It feels way softer than it ever has with other dyes and certainly softer than it was before applying this. I'm genuinely impressed with Garnier Color Sensation, they are my new favorite! Rated 5 out of 5 by Anonymous from Loved it! It was so easy to use and the color I used was Light Golden Brown. The color came out even. I've had trouble in the past with other brands being patchy. The color is so pretty and shiny. I just can't get over how healthy my hair is looking after dying it.